I thought, when I began this blog a few months ago, I knew where it was headed. I was chronicling our experience with infertility and embryo adoption and would document our continuing navigation of that path, along with our everyday experiences of parenting and transition to life as a family of four. I titled my blog “A Dash of the Unexpected.” It did occur to me as I typed in the title that I hoped I wasn’t setting myself up for…something. And now, here I am, sitting in front of my computer, attempting on a very few hours of sleep to document for you the last two weeks that have rocked our world and reshaped much more than the direction of this blog. 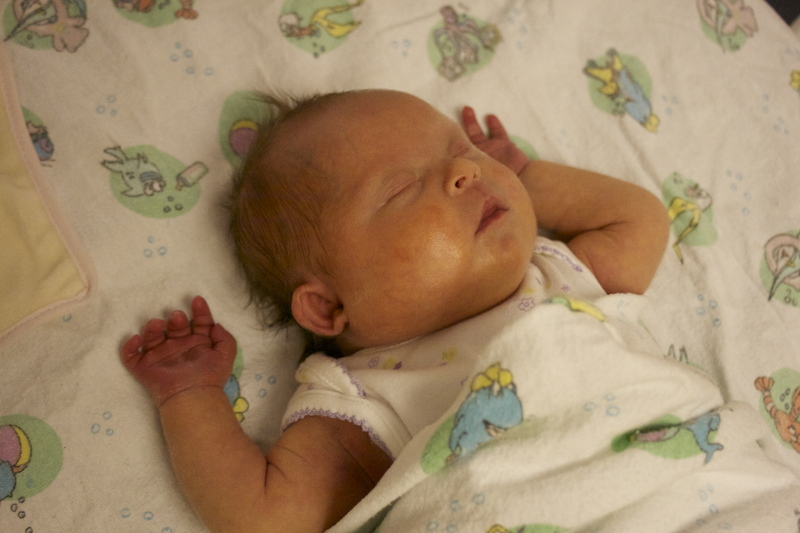 Our precious Eline Katherine was born last Thursday, September 13, at 11:27 a.m. She weighed 6 lb. 12 oz. and was 19 in. long. She was born at home, just as we planned. My labor began around 10 p.m. Wednesday night. Jon and I were watching an old episode of Law & Order. Jon was working from his laptop, as he usually is in the evenings. I’d had plenty of Braxton Hicks contractions for months, but something about these made me take notice. I didn’t say anything at first but just kept an eye on the clock. The contractions were coming about 10 minutes apart. Around 10:30, I casually asked Jon, “So… How’s your work load?” He looked at me for a moment and said, “It would be very inconvenient if she came now.” I said, “Well, that was probably inevitable.” I told him I wasn’t sure what I was feeling was labor, but it was a strong possibility. Just before heading to bed, I sat at the computer for a minute to catch up on emails. The last one I read was from our donor mom, telling me she had been thinking of me and that it felt like it was TIME. She talked about how certain their family was they had made the right decision in donating and about all the people who had gone into making our baby’s arrival a reality. Before I drifted off to sleep, I told Jon the contractions seemed to have eased a bit, and it was probably a false alarm. He stayed up for quite a while longer, working from bed. He finally put the laptop away and settled in for the night at around 1:30. I woke up as he draped his arm over my belly. I lay still as his snores began, riding out contractions I realized were much stronger and closer together. I still had an internal debate as to whether this was really labor, but the questions faded further with every contraction. I hoped to be able to get a little more sleep, but the nervous excitement and the increasing strength of the contractions made it impossible. I tried to rest and decided to let Jon sleep as long as possible. Around 4 a.m., the contractions began requiring active management and were consistently four to five minutes apart. I decided it was probably time to wake my husband. He went to work bleaching out the tub in case I wanted to labor there. I called our midwife, Kathy, to let her know where things stood. I told her we had things well in hand for now, and she could get some more sleep before heading our way. Jon ate a small breakfast, and I had a cereal bar (that I later threw up). Jon got a shower. Our bedroom was lit with candles, and I danced to a Jason Mraz song playing from our birth playlist. I plucked, because who knew when I would have time for that kind of maintenance again? At some point in those wee hours, Jon climbed in bed with me and we prayed together, for a safe labor and for our precious baby. Laboring, sometime around 5 a.m. I called my mom shortly after 5:30, when I knew she would be up, to tell her she would be watching her grandson rather than going to work. We arranged for her to come by at 7:00, about the time Corin would be waking up. When she arrived, my contractions were strong and about three to four minutes apart, and I had the shakes, which happened several times during labor. Corin was still sleeping, so she rubbed my back as I lay in bed. Once Corin was awake, Jon and mom got him dressed and ready to go, and I came out between contractions to tell him good-bye and that Baby Sister would be here soon. He seemed a little confused, but as usual, he was more than happy to go with Grandma. I, on the other hand, fought back tears. In the days ahead, I would think back on that moment and wish I’d had more time with him. As it was, I had to run back to the bathroom to ride out another contraction before sending him out the door. I labored in the tub, on the toilet, and eventually in the bed, where I could rest more completely between contractions. Jon, Gaylea and Kathy took turns providing support, allowing me to squeeze the blood out of their hands with each contraction. Gaylea applied heavenly-smelling cool rags. I’m not sure how long I labored lying on my side, nestled in the pillows, but maybe an hour later labor began to change, and the pushing urge arrived with full intensity. Kathy confirmed I was fully dilated and effaced. Now the real work began. At first, my pushing was not terribly effective. I was wearing myself out and beginning to hyperventilate. It felt a lot like the point at which my labor stalled with Corin, and I was scared and exhausted. Kathy and Gaylea both proved their worth so MANY times over that day, but it was at that point in my labor that my midwife knew just what to say to change my approach. She told me not to work so hard, but to allow my body to bear down and simply work with it. With that instruction, my approach changed, and immediately the pushing began to bear results. The work was HARD, and it was a bit frightening for me, since I’d never successfully pushed a baby out before. I badly needed the encouragement and soothing confidence of my midwife and doula. They gently reminded me that God had designed my body to do just what it was doing, and that I was fully able to deliver my baby. My labor with Corin began with my water breaking, but this time, as the baby began to move down with each push, the amniotic sac was still intact. The midwife showed Jon the baby’s hair swirling inside the protective barrier, and I was able to reach down and feel the protruding sac. A few more pushes, and the baby’s head emerged, carefully guided by Kathy’s skilled hand and still protected inside the intact amniotic sac. Kathy pulled the membrane away as the rest of Eline’s body emerged. Our baby girl was born “in the caul,” a rare occurrence that historically was fraught with superstitious meaning. In our case, we believed it was a direct answer to prayer. I had tested positive for Group B strep, a bacteria that in rare cases can cause a dangerous infection in infants exposed during delivery. Kathy would have been able to administer antibiotics during labor if it was necessary, but because Eline was fully protected in the amniotic sac throughout the entire labor, she was never exposed to the bacteria. I was able to hold Eline immediately after birth. She did not immediately cry, but Kathy and Gaylea rubbed her down and her wails filled the room. I was incredibly relieved and overwhelmed as I held her to the breast and marveled that our precious baby girl was here. Jon kissed me, and together we counted fingers and toes and looked at baby Eline’s thick, dark hair and chubby cheeks. We drank in those quiet moments together after Eline’s birth, thanking God for her safe arrival as we held her close. Kathy weighed her and did her newborn assessment, which Lina passed successfully. As it happened, that precious hour or so was the calm before the storm. This entry was posted in Our Story and tagged embryo adoption, home birth, pregnancy. Wow! I am amazed at how similar our labor was. The times you started laboring, your approach to not waking up Jon, etc. made me think of our experience with delivering Kylie. Touching!